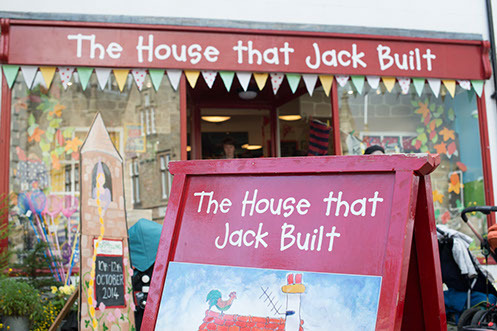 When Jack decided to build his house in Settle, he wanted to ensure it would be a bright and engaging place for children of all ages. Over two floors Jack stocks a huge range of traditional toys and include brands such as Melissa and Doug, John Crane, Hippychick, The GroCompany, Manhattan Toys, Moulin Roty, Haba, Plan and Le Toy Van. He is delighted to provide an outlet for Piccalilly a local organic childrenswear range which is complemented by the funky designs from Frugi, Hatley and delightful pieces from Organics for Kids. The store celebrates the area’s farming roots by dedicating a section to agricultural toys and stocks Bruder and Siku lines. In Jack’s kitchen you’ll find all the equipment and ingredients needed for the budding chef and little thespians can find his fancy dress section upstairs. Jack’s parlour has nostalgic games, jigsaw puzzles and children’s books. There are wellies for wet weather and as the sun begins to shine Jack makes sure he has a range of outdoor toys and kites in store as well as swimwear and goggles. Throughout the shop he has lots of pocket money treats, party bag fillers and silly things that make you smile! Jack hopes you enjoy visiting his house and would love it if you could join his mailing list so that he can let you know of any special promotions or invite you to any exciting events that he is planning.